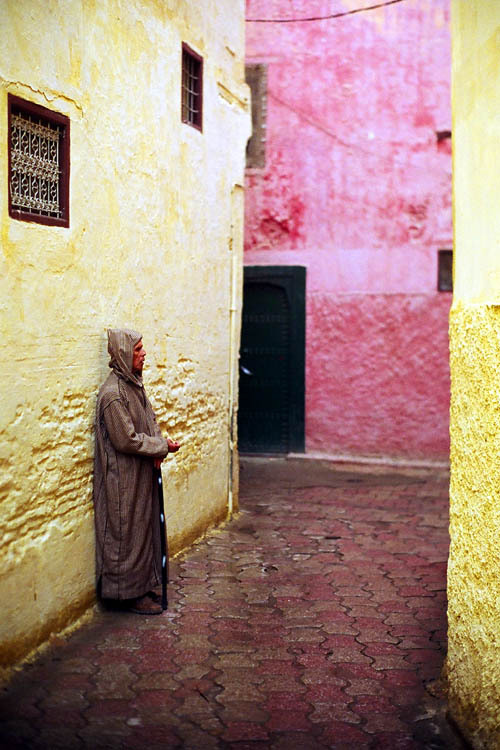 A few years ago on the sunny plains of Southern Spain I once met a sagely fellow traveler who spoke of the fantastic wonders of Morocco with an almost religious fervor, as I recall his advice was simple... "dude you should go", hmm one day I thought . Below the tortuous white washed alleyways of the aging blue kasbahs of old Rabat and the forgotten shores of Salé where tumultuous Atlantic waves pummel the desolate sands there exists a small serene estuary. Through a curious haze flocks of blithe seagulls floated peacefully overhead as I traipsed toward the estuary across the murky sands made wet and boggy by the constant drizzle. At length I came to a dock of sorts, a stack of bread cartons floating in the shallow waters and a humble rowboat gently rocking back and forth. 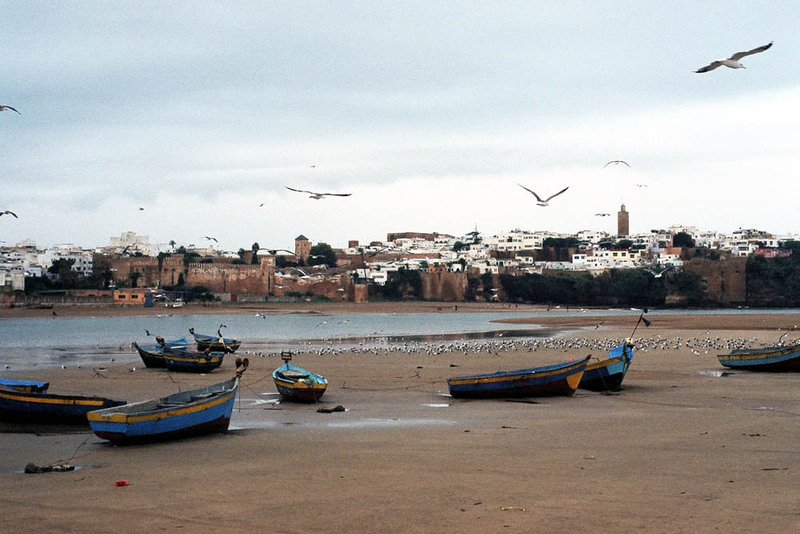 The quickest way between the twin cities of Rabat and Salé is to cross the estuary. The shore was quiet and bizarre, for all I know I could have been crossing the river Styx in Hades only my ferry driver wasnt Charon, it was a Moroccan man of slight build with bare feet and a peculiar yet endearing proclivity for blatant fits of unprovoked laughter. I stepped in the boat and paid 2 dirman to cross. His eyes were puffy and red, the universal kind of puffy and red rendered that way only by the most potent concoctions of hashish. As we set off he even offered me some rif (as its known locally) but I politely declined the slobber covered spliff. He propelled the make shift oars slowly forward and through his quirky grim he continued to chuckle and kept repeating something in Arabic I couldn't understand. After a short while I stepped off the boat and wiping the rain from my face set forth into city of Salé past the wild dogs, past fishmongers with their myriad nets, past a small local soccer arena and into the medieval medina or old city . As I ambled about I noticed the locals staring at me, by this point in my travels I've come to fully embrace that distinctive out of place feeling, ah to be a stranger in a strange land. I began my trip in Casablanca just before I journeyed to Salé. About a week before I arrived in Morocco I walked into the council travel office with little if any semblance of where I wanted to go. About my only requirement was somewhere far away that I had not previously been. Ten minutes later I walked out of the office with a coach class ticket to Casablanca, Morocco, here we go again. Planning is not my strong suite, so as I cracked open my Lonely Planet Morocco on the plane for the first time I wondered where the romantic winds of travel would take me on this trip. After a rather rougher than usual landing I was in Casablanca and for the second time in about as many months I found myself back in the alluring clutches of North Africa. About all I knew about Casablanca was that in the classic film Humphrey Bogart kisses Ingrid Bergman goodbye in the end. What I discovered was considerably more. The dichotomy of Casablanca is unique, as it is at once a hustle bustle port city with typical French colonial motifs and a city of ancient riches with medieval walls shrouding ancient medinas. My drowsiness and jetlag evaporated instantaneously as I walked passed the numerous cafés and eventually ended up in the old city amongst sleepy bazaars and cobblestone alleys. Walking around I made my way to the most beautiful of mosques. The Hassan II mosque is the third largest mosque in the world after the Saudi mosques of Mecca and Medina, apparently its grounds accommodate 100,000 people. It strikes a commanding presence stoically perched on a giant pier-like platform surrounded on three sides by the ocean as huge gray waves crash onto its steep impervious walls. The railway system is fairly efficient in Morocco. The train arrived from Casablanca right on time and I emerged into the city. As the capricious whims of fate would have it each day was filled with rain, a situation which I really didnt mind as in an odd way it added to the surreal atmosphere. I found a hostel and dropped off my backpack, a very peculiar place as all the walls were painted a bright pink. Rabat is a curious amalgamation of aging buildings, cavernous markets and brilliant minarets surrounded by lush gardens. The edge of the city sits on a hill overlooking the Atlantic. Rabat doesnt really feel like a capital city but does boast assorted grand avenues and it is hard to escape notice of the ubiquitous portraits of the king striking patriotic poses plastered everywhere from coffee shops to street-side billboards. 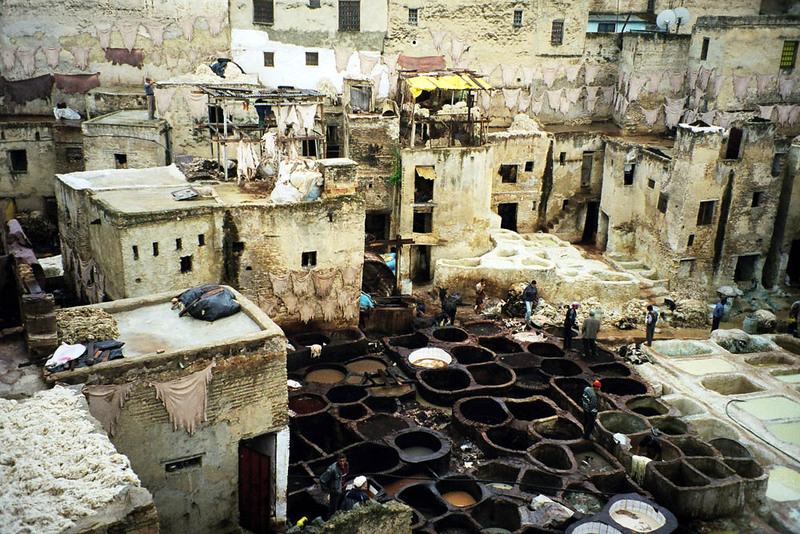 The strong fetid odor emanating from the leather tanneries in Fès offers little olfactory pleasure, however despite the stench viewing the tanneries of Fès was one of the more interesting legs of my journey (besides it is easy to battle the smell by putting a mint leave under your nose). The dyes are made of sulfurs and various hydrocarbons. The tannery pits are best viewed from the tops of the surrounding buildings. Here leather is fashioned the way it has been for centuries, with very little change. Huge wooden waterwheels churn and hundreds of clay wells dug into the red earth are filled with different colored dyes, the net effect is the ground as far as the eye can see looks like a colorful painters palate. The tireless laborers jump in the wells up to their hips and stamp on the leather. Cowhides dangle from the walls looming high above the pits. The place is really quite fascinating. Outside the tanneries one enters the souqs, the vast gauntlet of small alleyways and twisted corridors that comprise Fès medina. The market streets wind past centuries old medersas and ancient mosques. Each shop vends specific products from lampshades to local spices to tin and metal works. Food vendors tempt the visitor with delectable tangine chicken baking from clay pots and tahira soup along with some of the worlds seemingly most unusual pastries. Meknés is an ancient city of grand caravanserais, towering gate walls, and as with other Moroccan cities the requisite souqs and medinas. The Bebers are the indigenous North African tribesman. A mysterious culture, they wonder the souqs cloaked in dark hooded robes as the peculiar cross and dagger symbols tattooed a dark green on their chins and foreheads add to their cryptic ways. As I walked past the snake charmer crooning sonorous tunes from his horn I noticed the large jet-black cobra undulating to the hypnotic melodies. 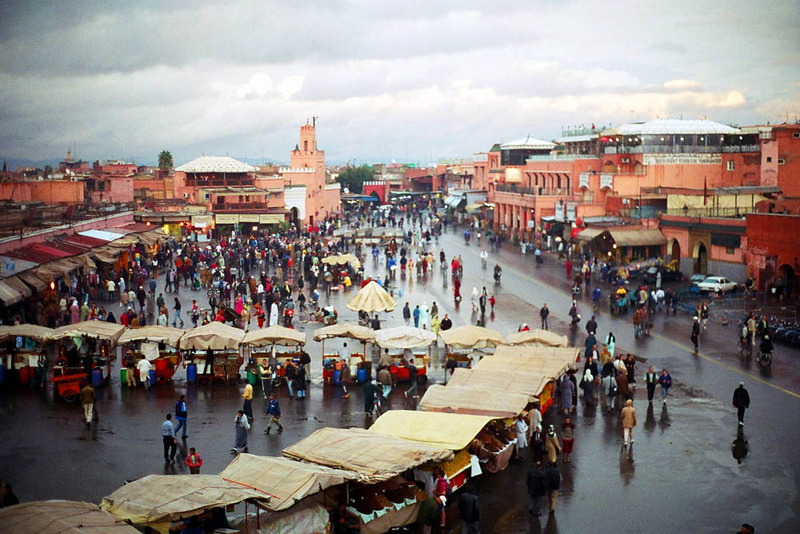 No amount of colorful adjectives can covey an appropriately accurate description Djemma El Fna square. The crowd in this most exotic of squares is by and large local. A strange land to say the least. Large crowds gathered around fortunetellers who loudly shout cryptic Arabic incantations into the air as they scribble strange astrological chalk diagrams in the asphalt. A storyteller shouted even louder as another crowd huddled around to listen to fantastic tales in Arabic and Beber language. His face contorted grotesquely as he screamed into the air placing precise emphasis on certain words while keeping other words to a just audible whisper. He was old and the skin above his eyes thick and wrinkled like the frayed green cloth covering his head. Other crowds gathered around the gamblers engaged in boisterous shell games and the impromptu boxing matches fought between teenagers with tattered gloves. Like a 50 ring circus the senses are all but overwhelmed. The aroma of exotic food permeated the air as vendors boiled snails in huge vats and others skewered whole lambs heads over open fires. The square is surrounded by centuries old fortress walls and red sandstone minarets that spiral higher than the verdant palms shooting in to the air. Old men in colorful garb wondered the square vending mint tea and young boys lead small monkeys around with leather leashes. One vendor had a table selling hundreds of human teeth for no apparent reason, even more surprising was the fact that people actually bought them. Here the mentally ill embrace life in a place where they really dont seem more manic or detached from the earthly realities of everyday life than the fortunetellers and storytellers. In short a place of captivating madness. The Oukira valley is quite the scenic departure from the carnival like atmosphere of the bigger cities. Rural Beber villages sit in majestic valleys nestled in the shadows of the Atlas Mountains. Gushing rivers flow past towering hills. The pace is slow as the hospitable locals tend their goats and smile. A fitting end to a Moroccan journey.